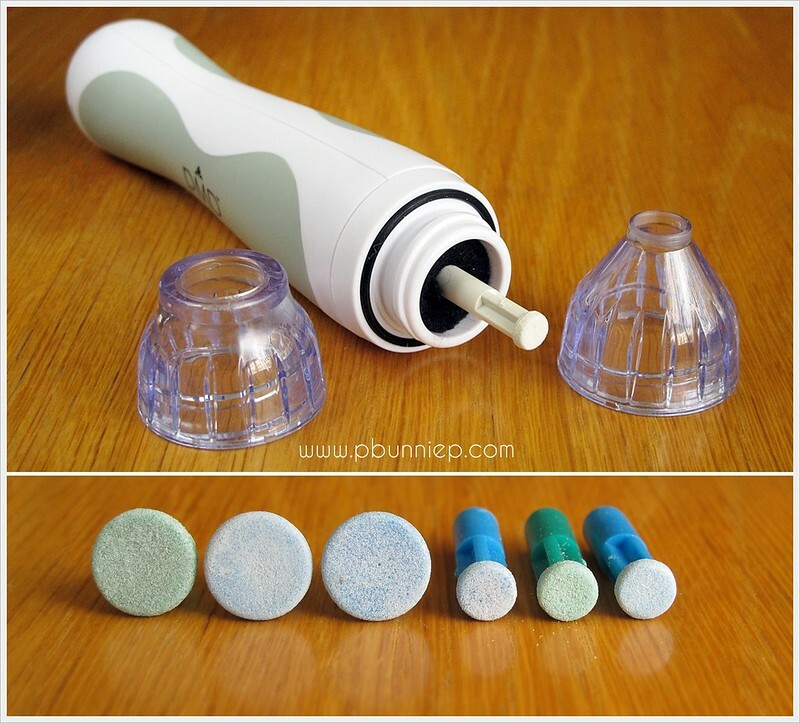 TheBunnieHole | Vancouver Youtuber & Blogger: Review: Personal Microdermabrasion (PMD) at home! 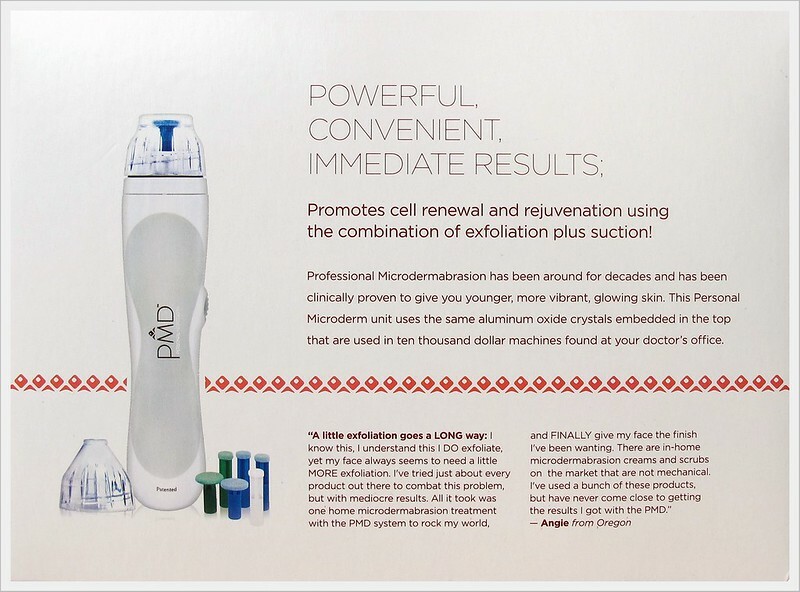 Review: Personal Microdermabrasion (PMD) at home! Getting good skin is a complicated process, unless you've been blessed with natural clear unproblematic skin you've likely dealt with a rainbow of skin issues through out your life. When we were younger it's usually acne and oily skin, once that subsided in comes the large pores and acne scarring and just as you thought your skin has settled down, you notice those first few tell tale signs of aging. It seems like an everlasting on going process. One of the key things to a good skincare system is exfoliation, it helps to rid the skin of dead skin cells on the surface layer, speeding up the renewal process and thus keeping skin at it freshest all the time. I'm no stranger to exfoliators, having used my fair share of scrubs and peels but recently I've discovered a new love and I couldn't be more thrilled with it. 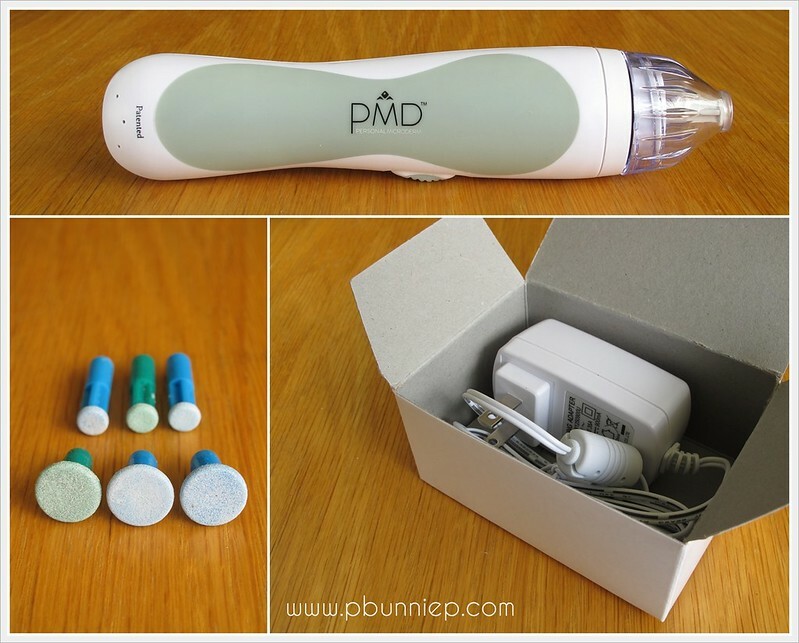 Let me introduce to you the PMD, also known as the personal microdermabrasion system! It is one amazing little gadget and has absolutely rocked my world in for the past month that I've been using it. Before I get too ahead of myself, I should probably explain this fancy term "micro-dermabrasion". It's an intensive exfoliation treatment for the skin, buffing off the surface layer of dead skin (traditionally) using aluminum oxide crystals. It's finer than the grains found in your average facial scrub, it works more evenly, thoroughly and much more effectively. However, micro dermabrasion used to come with big price tags and an appointment with a salon or aesthetician. Now PMD has made the process simple, convenient and much more economically priced. And to stress my point on how simple this tool is, here's the only three things that you'll need to get going. The PMD tool itself, a handful of buffing discs in various intensities and your power cord. There aren't any fancy bits and pieces to attach and no settings to learn, simply choose your disc, plug it in, turn it on and you're ready to start. 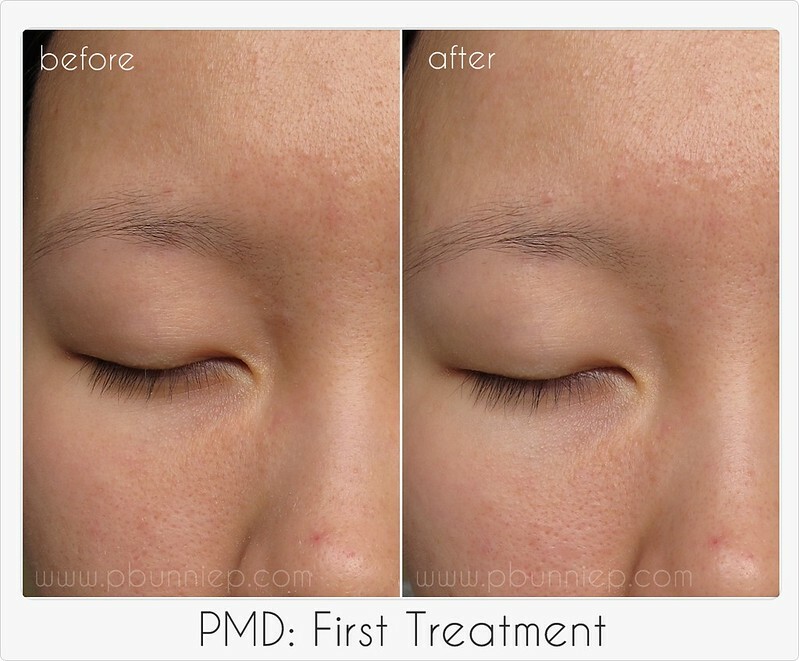 Eager to test this out, I took some photographs of my first PMD treatment. I struggled a little with knowing which direction to go and getting the right suction on my skin but after a few minutes it was smooth sailing. From my first treatment, I noticed quite a bit of overall brightening of my skin. My skin felt very smooth and although the small bumps on my forehead were still visible immediately after my treatment, they became much more reduced after my second treatment. 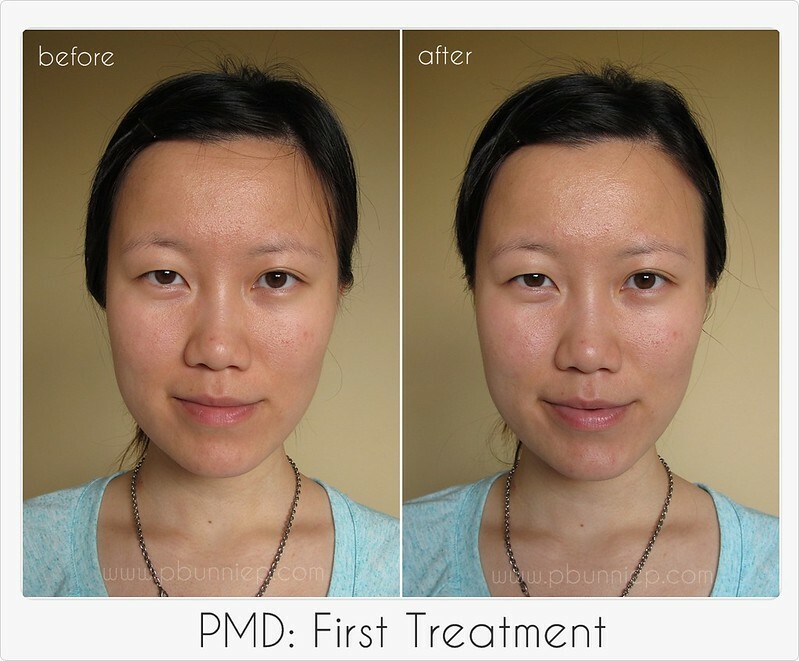 I've since used the PMD treatment four times already and the results just keeps getting better. I've noticed my skin texture becoming my refined, my foundations sitting on my skin smoother and moreover my products penetrating easier into my skin. The most exciting things for me personally was the improvement in the darker areas of my forehead and also the fact I can use this on my body as well to help treat scars and rough patches. I shall never have scaly elbows or knees again! I can see it having great potential for anyone who is battling skin issues, from those with younger spot prone skin to those trying to diminish pesky fine lines and sun spots. Things to note: Beware of using too many exfoliating products all at once, you may over sensitize your skin. During the two days after my PMD treatment I stopped using my Clarisonic and also switched to a very basic and gentle facial moisturizer (Kiss My Face: Vitamin A&E Ultra moisturizer. See review here.) Do not use this over any open sores or broken skin and as always load up on your daily SPF. Like I said in the video, your skin is going to be the first thing that you put out there everyday, against the elements in wind, rain or sun. It's also one of the first things that people will notice about you (whether you like it or not) and I believe having clear healthy skin is the ultimate confidence booster. So do a little something special for your skin and keep it looking it's best. You can find the PMD on their website. Read more about the product and watch their how-to guide for a user tutorial. I found the video to be extremely helpful and much more fun to than reading the paper manual. Use coupon "PBunnieP" for 25% OFF your PMD purchase! How amazing is that! You can bet I'll be reordering my exfoliating discs once I run out and I love that replacements are very affordable as well (here's looking at you Clarisonic). I hope you enjoyed my review and have a wonderful skin day! Microdermabrasion is of course a fantastic procedure to make our skin feeling smooth, supple and refreshed. And it is so glad to hear that these kind of products offer us same benefit even without a consultation from any our nearby non-surgical aesthetic clinic.